Take your pick of spring concerts featuring EMU orchestra, wind ensemble, jazz combo and choirs — or come to all! 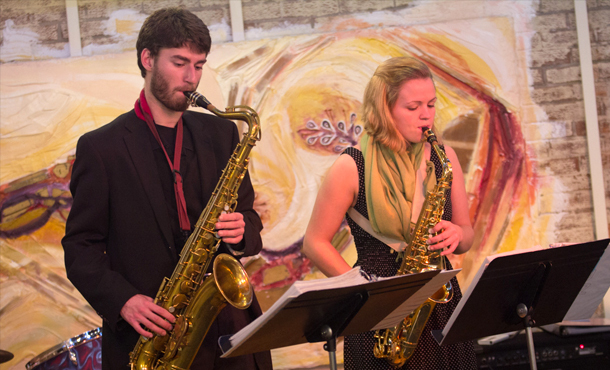 Spring offerings from the Eastern Mennonite University Music Department include the following concerts. The EMU Orchestra will perform music highlighting the string section. Repertoire includes Vaughan Williams’ beautiful “Fantasia on Greensleeves” for strings and harp, Telemann’s “Viola Concerto,” Piazzolla’s “Spring” from The Four Seasons, and Turina’s “La Oracion del Torero,” Student soloists are violist Katrina Poplett and pianist Giulio Garner. April 1: Senior Recital, Martin Chapel, 7 p.m.
Caitlin Holsapple, mezzo soprano, performs. Music selections include multiple styles ranging from classical to jazz and contain world music samples ranging from Venezuelan to African. Arrangements of folksongs, accompanied by Seaman and Robinson, will also be featured, along hammered dulcimer player Timothy Seaman and Celtic harpist Ann Robinson from Williamsburg, Virginia. The concert, at 7:30 p.m. in Lehman Auditorium, will feature selections from Holst, Milhaud and Persichetti as well as special selections for woodwind trio and duo. Members of the Fort Defiance High School Band are also featured. John Dull conducts. Admission is free. Donations are welcomed for the EMU music scholarship fund. This concert features the Women’s and Men’s Choir performing “Frostiana” by Randall Thompson. A description of the program includes a quote from St. Augustine, “It is solved by walking,” and the following description: Through a meditation guided by medieval and contemporary scripture, poetry, and song, listeners will be prepared to walk toward the labyrinth, enter in calm silence, and walk humbly with God. A labyrinth is a spiritual tool serving as a walk-centering activity for the human heart, mind, and soul resembling the indirect path of our lives, which leads us into the center of the human condition, the heart and mind of God, the very core of illness or pain, and the focal point of enlightenment or understanding. 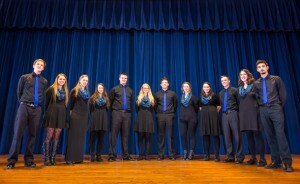 In addition to the on-campus concert, Emulate will present the “Amazed with Grace” program at three other locations during April: April 14 at Eastern Mennonite High School chapel; April 21 at VMRC at 7 p.m.; and April 24 at First Presbyterian Church in Staunton, Virginia, at 11 a.m.
Come join the EMU Jazz Combo for an evening of jazz standards and contemporary compositions by Duke Ellington, John Coltrane, Sonny Rollins and others. The concert takes its inspiration from the words of St. Augustine [354-430]: The world is a book, and those who don’t travel read only one page. It’s the same way with music, says director Ken J. Nafziger. This concert, featuring the 19-strong Chamber Singers, will begin with a series of hymns by the Argentinean singer/song writer, Pablo Sosa, several of which will invite the audience’s participation. The second part will be a musical excursion through this season of the church year, from Holy Week through Pentecost, with music from Austria, The Netherlands, South Africa and the Philippines. The third section, featuring guest musicians, will be music drawn from African-American gospel sources. Singer Lauren Gibson ’14 will perform, as well asa band of current students Bruce Cypress on drums, Matej Gligorevic on electric guitar, Londen Wheeler on piano/keyboard and alumnus Michael Allen ‘13.